The world is maintained by "The Master." Tanzra "The Evil One" is the eternal enemy of The Master and wishes to conquer the world. His six Guardians attacked The Master in a battle that lasted several days. After the battle, the Master retreated to his Sky Palace, which floats in the sky atop a cloud, to tend to his grave injuries. He erected a barricade and fell into a long and deep sleep. With The Master incapacitated, Tanzra divided the world into six lands, each ruled by one of his guardians. The Master awoke several hundred years later with his injuries completely healed, but his power had been removed as the people turned towards evil. He removed his barrier from the Sky Palace, determined to free the world from The Evil One. 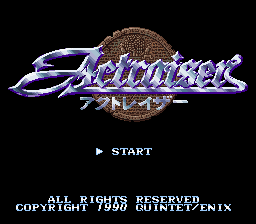 Actraiser was the fourth Super Famicom title boasting fantastic graphics and sound considering the fact that it was such an early title. 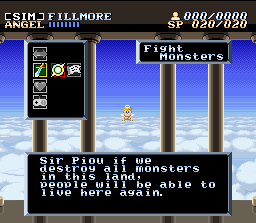 The game looks and sounds better than later titles during the Super Famicom's dominance. 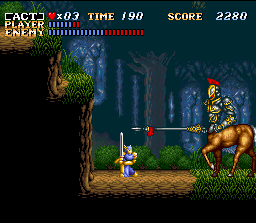 Actraiser is very unique and considered to be one of the first games to combine action with simulation like no other. To put this in a "nut shell" you play The Master role trying to reclaim the earth back from the Demon named Tanzra along with his guardians. The lands need to be made clear of monstrous creatures, enabling humans to be reborn. You will then create various environments, building towns etc, clearing rocks, trees with your various magical powers to make the land habitable. Problems arise during the course of the build and you will need to stop disputes between humans, also you will cure diseases and douse fires. Once all the problems have resolved a monstrous creature appears and threatens the balance of your society, you will need to come down to earth and battle with the creature and destroy it. Each area is divided into 2 acts, first the simulation aspect and then followed by the action (12 stages). I have never been a fan of Simulation games however, I love the tasks involved and they are fun and keeps you very busy and interested. Finally you have the side-scrolling act to look forward to, I find this to be similar to "Castlevania" apart form the difficulty (yes, very easy) even the end of level bosses are easy to defeat. 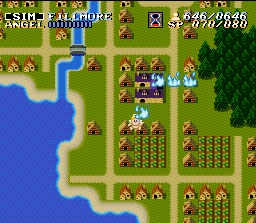 The graphics in Actraiser are fantastic both in Simulation mode and Action mode, particularly the Action mode, it has some of the best graphics for the Super Famicom. The back drops and sprites are excellent, great attention to detail - nothing is neglected. I almost forgot, expect to see "Mode 7" too. The music score is unbelievable for a console back in 1990, it all adds to the great atmosphere and gaming experience. It's a shame the game is easy (FYI, easier on the Snes version). None what so ever! Erm... it helps if you know Japanese!!? Otherwise you can rely on the good old trial and error technique and you soon remember what to do. Trust me, that's how we done it back in 1990!! 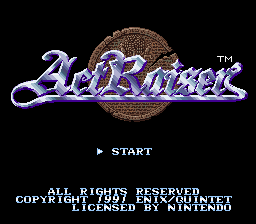 Actraiser is another easy title to find on Ebay. Expect to pay £15 for a (MIB), £10 (CIB) and £3 for a loose cart. Don't be fooled by rogue sellers, I would not pay more than the afore mentioned prices. 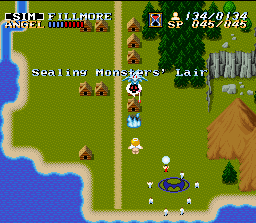 Actraiser puts the fun into a Simulation game and introduced a unique style into the game genre, encompassing its action elements. I for one consider this game to have one of the best graphics and music for the Super Famicom, The game is widely recognized for its music score. One of the medleys from Actraiser arranged by Yuzo Koshiro was performed live at the second annual Symphonic Game Music Concert in Leipzig, Germany in 2004. Actraiser is a great game, fun and very satisfying to play. It was an innovative game for it's time, another must have title for the serious collector!! Not exactly game related but awesome none the less, there is a band with a "similar" name, ACT RAISER. They have a pretty sweet video for their song Ghost Princess by CAT*TRASH who has done some more pretty awesome videos.